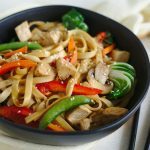 Chicken Lo Mein is a take-out favorite that quick and easy to make at home! Lo mein noodles, chicken, and veggies topped with a flavorful sauce! In a small mixing bowl, combine soy sauce, sugar, sesame oil, and ground ginger. Mix until well combined. In a large pot, cook lo mein noodles according to the instructions on the packaging. While noodles are cooking, place a large pan over medium-high heat. Drizzle olive oil and cook bell pepper, peas, carrots, chicken, garlic, and mushrooms together for 4 minutes before adding in the bok choy and cooking 3-4 more minutes, stirring frequently. The vegetables should be tender and the bok choy wilted. Once noodles are done cooking, drain and then add them to the pan with the chicken and veggies. Pour sauce over everything and mix together until well combined. Top with sesame seeds and serve immediately.